Happiness is never constant, and it’s not supposed to be. – You have to fight through some bad days to earn the best days of your life. To believe that you can reach a state of happiness and stay there forever, is like the tide believing she can reach for the shoreline and remain there forever; or like a fruit tree believing that if she only holds on tighter, she can keep her fruit from dropping to the ground. Happiness is simply a series of moments that come and go and add sweetness to our lives. Learn to accept this, and the more happy moments you will have. 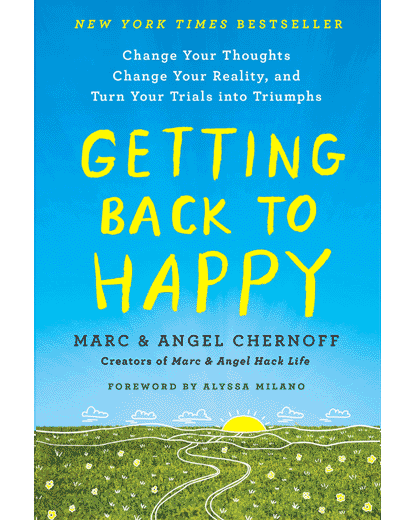 Read The Happiness Project. How you feel when you’re stressed is not a true measure of reality. – Just because you’re afraid, doesn’t mean you’re in danger. Just because you feel alone, doesn’t mean nobody loves you. Just because you think you might fail, doesn’t mean you will. Look beyond your doubts and keep searching for the truth. Be aware of your mental self-talk. We all talk silently to ourselves in our heads, but we aren’t always conscious of what we’re saying or how it’s affecting us. The way to overcome negative thoughts and destructive emotions is to develop opposing, positive emotions that are stronger and more powerful. Listen to your self-talk and replace negative thoughts with positive ones. The sun is always shining on some part of your life. Sometimes you just have to forget how you feel, remember what you deserve, and keep pushing forward. You are not what happened to you in the past. – No matter how chaotic the past has been, the future is a clean, fresh, wide open slate. You are not your past habits. You are not your past failures. You are not how others have at one time treated you. You are only who you think you are right now in this moment. You are only what you do right now in this moment. Read The Power of Now. Filing this one away for the 100,000 times I’m going to need it in the future! Thanks! Very nice thoughts. Thank you. Ah, the stuff life’s is truly made of! Know that this is worthwhile to absorb at any age. I’m 59 and still on the exploring journeys. Wish I’d been aware of these life lessons years ago, but so glad I can be part of it now. We just don’t know what we’ll be handed, but the ability to take the experience for what it is, an experience, will make your lives so much better. You’re not what you drive or live in, but just who you are. And that’s wonderful. Embrace it. I am sure you know what a wonderful job you guys do each time you write something. But I wanted to say that your blogs are a lovely reminder that HOPE still lives in our hearts… always. Thanks for such beautiful thoughts! Admiring the strength here. I’m happy I came across this site today! This is an amazing article. Thank you Marc and Angel. You’ve been a good friend to me just by writing this. I like the inspirational message you share of “If you don’t see it now, you are making progress.” Many times we are in that space aren’t’ we? We then look up and see how far along we have come! Wonderful post. Thank you for this perceptive and supportive post. It reminds us of several aspects of life that we forget are so interconnected…life is not a Disney movie, avoiding difficult emotions does not work. Sitting or walking with them or talking about them or drawing or writing them does, and enables them to be digested over time. The past is actually not happening now. When we are acutely miserable or afraid, it will pass. Thanks for putting this together in such a compassionate clear way. This is definitely what I needed to hear today. Thank you. Thank you Marc ! I always look forward to reading your blogs and I wish you could be my friend… you have a way of motivating and encouraging your Readers ! This article was very helpful to me, appreciated. Really nice and pleasant… Thank you so much. This article by far is the BEST one I have read. I mean, all your articles are great, but this one I found to give me that “ah ha”. Thanks! !